[Since Mark Wallace’s Actual Board Game Journalism went down so well, we’ve decided he’s allowed to stick around. For now. Mark: If you think of yourself as a certain type of freewheeling gamer, you’ll like the sound of an interstellar commerce game that comes complete with spacelane pirates, racial technologies, first contact with far-off cultures, and an alien salesman who needs a lift to the Volois’ system after waking up hungover on the Zums’ delicious chicle liquor. Yes, you say to yourself, I’m ready to blast off into space! I can’t wait to buy low and sell high! 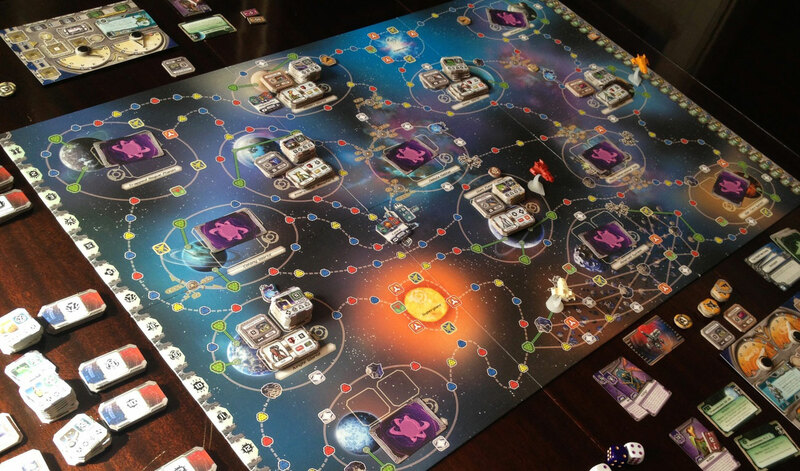 I’ve been searching for a game of “space exploration and interstellar trade for 1-4 players,” as it says on the Merchant of Venus box (which happens to be decorated with some really outstanding art from someone called Alex Aparin). Let’s go! So you gather a few like-minded friends (unintimidated by the words “two to four hours”), recruit yourself a Whynoms pilot (known for their mastery of telegate technology), fire up your engines, set your heading, and undock from Galactic Base with a roll of three “speed dice” (otherwise known as “six-sided dice” here on Earth) — only to have your drive sputter as you enter orbit around the nearby Nebula Habitat. You’ve hardly got your star boots wet and already you’re stalling out in the spacelanes, adrift in the vacuum before you’ve had a chance to taste the life of the trader, the mission-runner, the miner, or the interstellar real-estate baron. And Merchant of Venus lets you get a taste of all those lives — as well as the skybound cab driver and the roving pirate hunter. As you rocket off to make contact with your first alien civilization, the game may look like a case of buying low and selling high, but it turns out to be a much broader, somewhat deeper, and in some ways more diffuse experience, though one that comes into relief only after several cycles through those two to four (or maybe six) hours that you were feeling so optimistic about earlier in this review. 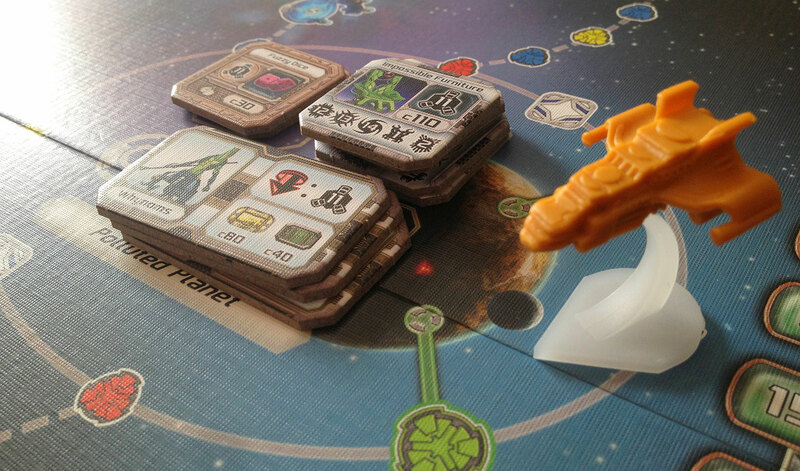 On the surface it seems simple: Players take it in turns to pilot their spacecraft through 14 star systems, discovering 14 alien races, hauling and trading goods and passengers, and upgrading their ships and pilots by purchasing alien technologies and generally levelling things up. 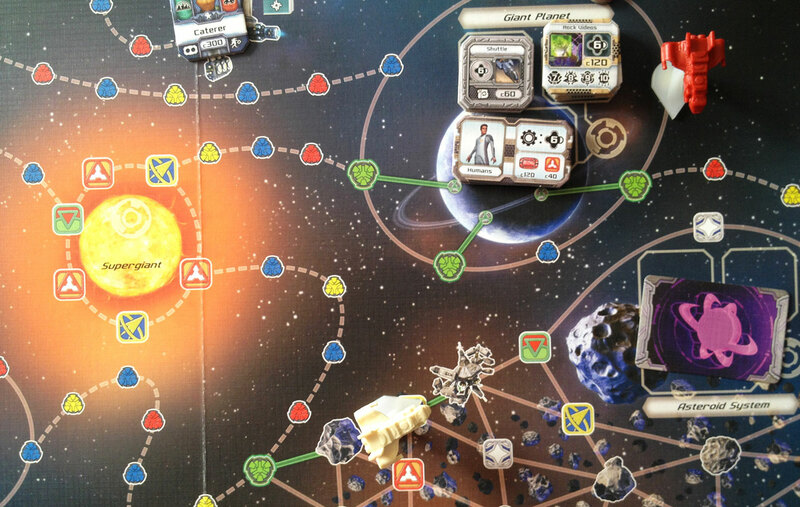 Discovering new civilizations in the early game provides important advantages: The first player to arrive at an undiscovered system reveals the (randomly placed) race that inhabits it, the ship upgrades sold there (including a racial technology in limited supply), and its trade goods, and receives a credit that can be spent with that race. Interstellar passengers can be picked up for delivery, and enterprising pilots can build a spaceport in orbit, at which they’ll be able to tax other players’ transactions. Early on, though, MoV feels a bit constrained. Until you’ve upgraded your shields, lasers, and pilot skill (which may take you half the game’s 30 rounds to do completely), travel through the galaxy can be a frustrating affair as you’re stymied by skill checks and have your cargo stolen by murky pirates. It’s not that upgrades are important — it’s that they’re indispensable. I have an unaccountable love of extra cargo holds — but forgoing early shield and laser upgrades left me too often feeling like my spaceship had blown a flat tire. 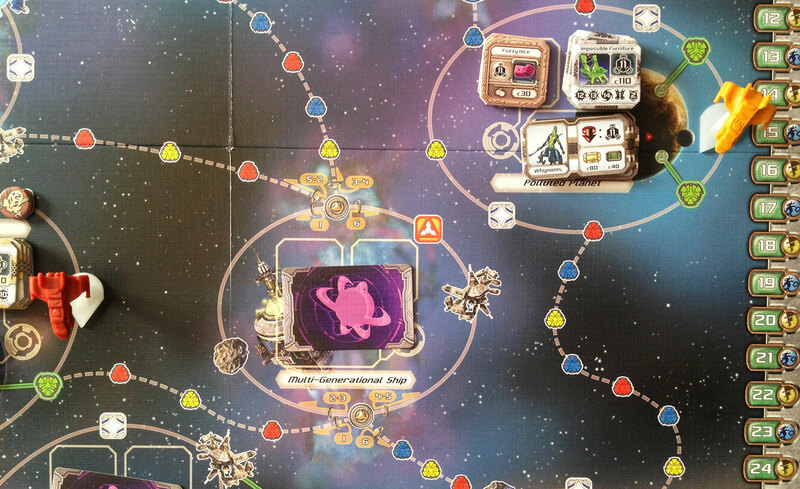 Turning a 16-space movement roll into a 2-space move on account of nothing but a mundane shield check isn’t unforgivable, but it does make me want to play Galaxy Trucker, where at least the setbacks feel satisfyingly like real disasters. 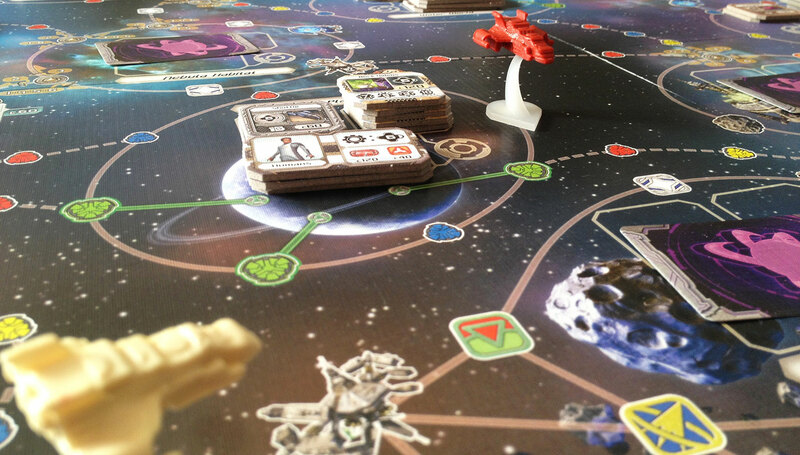 Doing it two turns in a row — while I’m sitting through the slow unfoldment of two or three other players’ moves between — makes me wonder why I didn’t just stay cozy on Galactic Base. This is space, dammit, I want to rocket off into it! And I want to do it now, as soon as I sit down to play, not wait two hours before I can get my spacevergnugen on. With the variety of tactics to pursue, MoV is a game that should be as freewheeling as you are. But it takes place in a galaxy so dense with rules and lookup tables that there’s little room to wheel as freely as you want to. 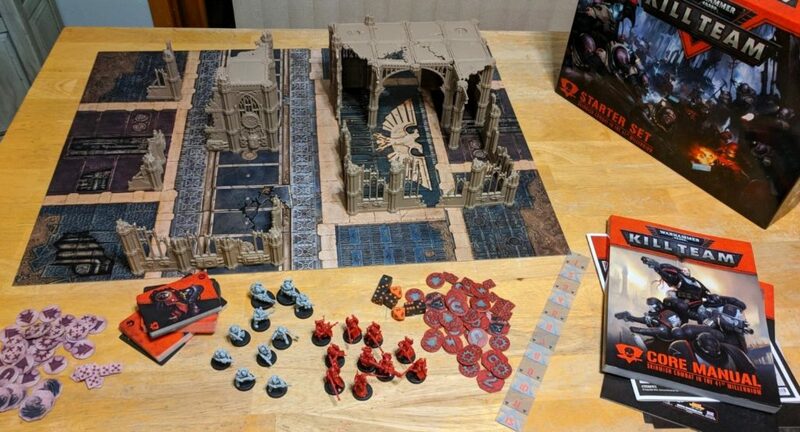 The game systems are balanced better than most — this is a polished design accomplishment — but there’s rarely the thrilling chaos of jockeying for the lead or racing to grab a crucial resource before an opponent. And that feeling of organized chaos can be the thing that takes a game from good to great. “Chaos,” of course, is different from “random.” MoV has plenty of the latter, some of which — like the random distribution of civilizations, and the draw of mission reward cards — work to keep things interesting. But the randomness can go too far here, as well. Case in point: The last time I played, I made a solemn vow to haul no trade goods at all, and to earn money and Fame solely from missioning, taxiing, mining, spaceport-building, and pirate-hunting. (And upgrading. Never forget upgrading.) As I thrustered around looking for passengers and yes, buying cargo holds instead of leveling my lasers, one of my opponents went for ruthless commercial efficiency, selling Rock Videos to the Zum at the Multi-Generational Ship, hauling their Chicle Liquor to the Cholos at the Water World, bringing their Designer Genes to the Qossuth at the Interstellar Biosphere, stopping at Galactic Base to drop off a passenger, then rinsing and repeating the cycle. You fool, I thought. What kind of fun is that? Look at me, zipping around the spaceways! Wheee–oops. Stopped short by a laser check again. Hours later, as we totted up our fame, I was sure my industrious friend would win. 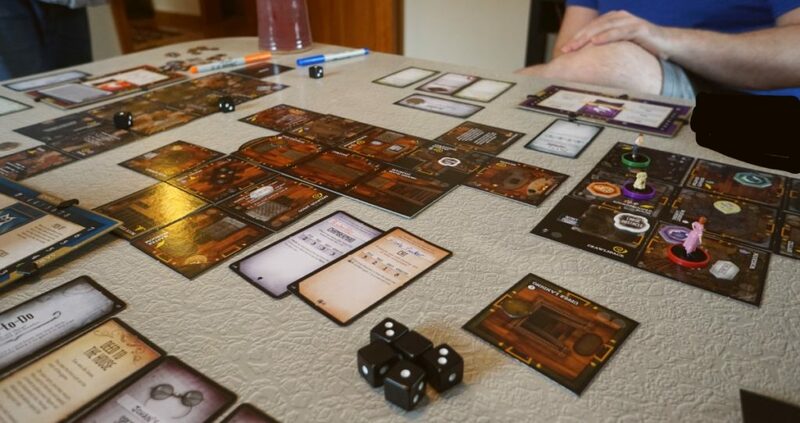 All three of us, however, had stopped at the Whynoms’ system and purchased the Fuzzy Dice racial technology, which adds two dice worth of Fame to your total at the end of the game and, if you roll doubles, lets you multiply your total Fame by 20 credits instead of 10. And doubles I did roll, giving me the come-from-behind win! I’d like to tell you this was satisfying, but it was anything but. My strategy had failed: without the doubles bonus, I would have come in last. The real winner should have been my other opponent, my friend Jack, whose strategy was, well, freewheeling. Jack had played the opportunist, hauling cargo where it was profitable and convenient, carrying passengers when he could, running more missions than either myself or my trader friend. 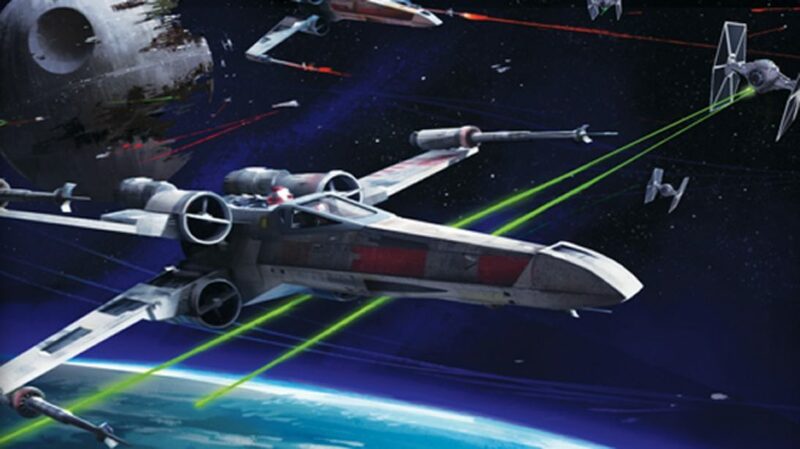 He had also been first to upgrade both lasers and shields completely, and to level his pilot up as much as he could. Jack played a killer game — for close to six hours — only to have victory stolen from him because I rolled a 5 and a 5 instead of a 6 and a 4. A victory for the freewheeling Jack would have made perfect sense. 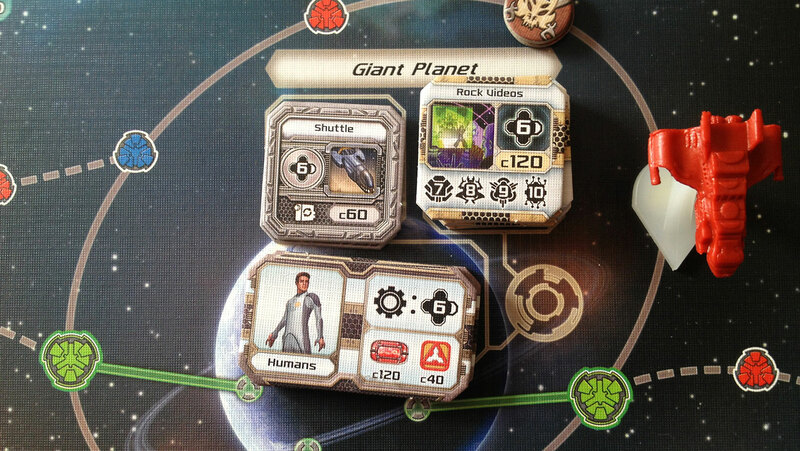 Merchant of Venus at its core — well, there’s the rub: Merchant of Venus really has no core. 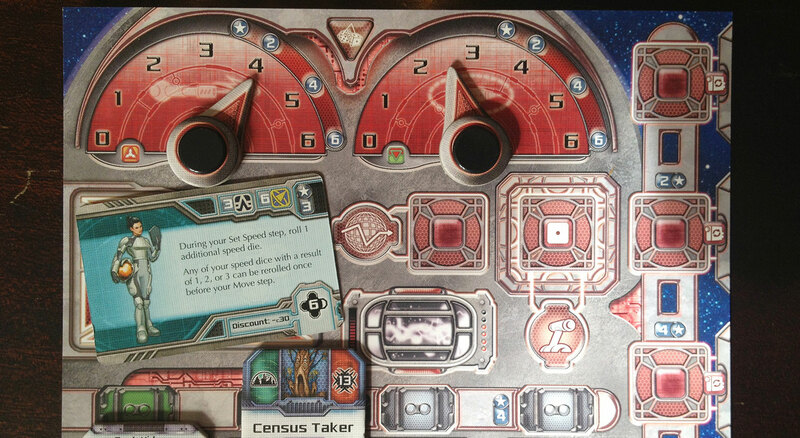 You’re a space trader, yes, but you’re also all those other things I mentioned up in the top part of this piece. And none of them seem to hold center stage in a way that provides a clear path of progress through the game. To equivocate for a moment: This is good and this is bad. If the game were simply a matter of optimizing your trade route, it wouldn’t appeal to the freewheeler in me. Merchant of Venus is a game about trading, yes, but — like its electronic cousins Freelancer and Eve Online — it’s really a game about choices. It rewards flexible, opportunistic play, and hints at giving you a variety of play styles to choose from. Despite its faults, I find myself wanting to jump back in my little compression-molded spaceship and see where the spacelanes take me. See you at Galactic Base!